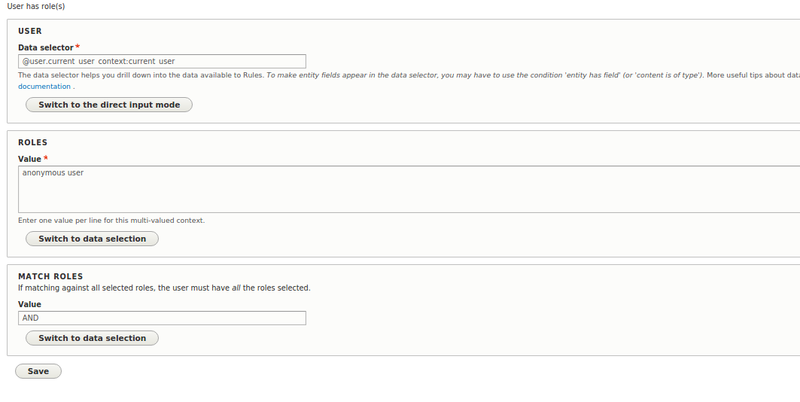 I'm using rules module with drupal 8 in order to redirect anonymous users to the login page after registration form submission, so I created a rule with react on event "After saving new user (rules_entity_insert:user)" because my account creation settings are : "Visitors, but administrator approval is required"
Warning: Cannot use a scalar value as an array in Drupal\Core\Field\WidgetBase->extractFormValues() (line 366 of /var/www/html/D8/core/lib/Drupal/Core/Field/WidgetBase.php). Any suggestion where i am missing something. Browse other questions tagged 8 rules or ask your own question. How to write a partial “setRebuild”?